With the arrival of spring and the upcoming religious celebrations of Passover and Easter later this month (April 19th and April 24th respectively) I have been thinking about the many rituals that we have incorporated into our daily lives. Just like these two holidays that are centered around a meal (the Seder and the Last Supper) many of life’s other rituals are celebrated with food, drink and sustenance to feed our bodies while our souls and hearts are being fed and nourished by community, friendship and family. 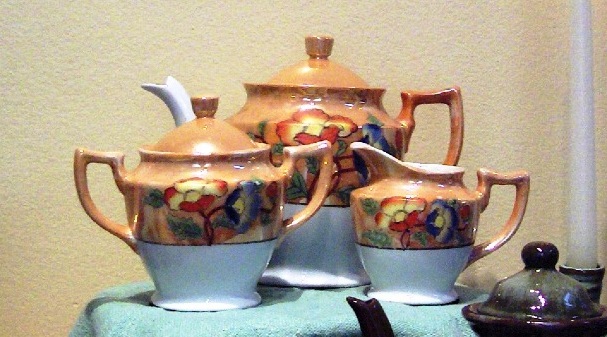 A selection of Tea Sets from England, Japan, Canada and Czechoslovakia. 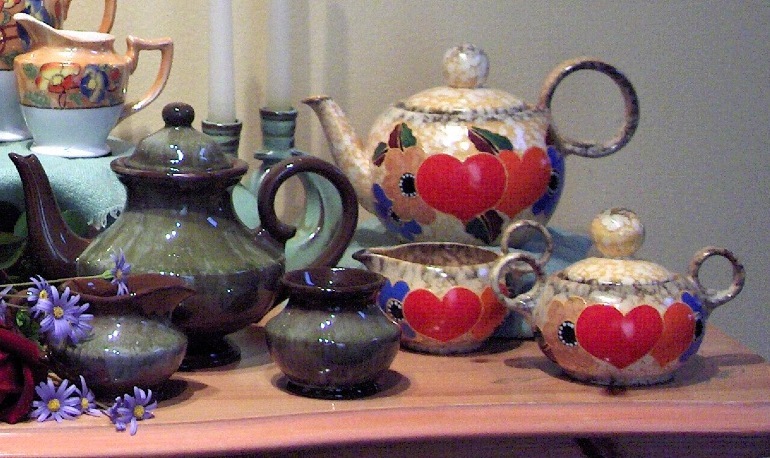 The Candle holders are by Frankoma Pottery of Oklahoma, c. 1951-78 5.5" Prairie Green Glaze, $39.00 for the pair. To the British and to many of those that reside in former British colonies one important daily ritual is “afternoon tea”. The daily “pouring of the tea” is an important ritual that brings cohesion to the often busy, chaotic and fragmented lives we live. It is a time to reflect on the day and at times to bring one back to a starting point where we can proceed renewed and nourished to complete the remainder of the day before us. It is not surprising to those of us that collect and admire ceramics that over the years there have been many different design styles employed in the creation of the vessels used to prepare and serve tea. Tea rituals are rooted deep in the history of many countries of the world with the creation of teapots and bowls designed with the ritual in mind. The Eastern cultures of China and Japan document that tea was introduced in as early as the 8th Century with the Japanese Tea Ceremony finding its roots in the 12th Century. 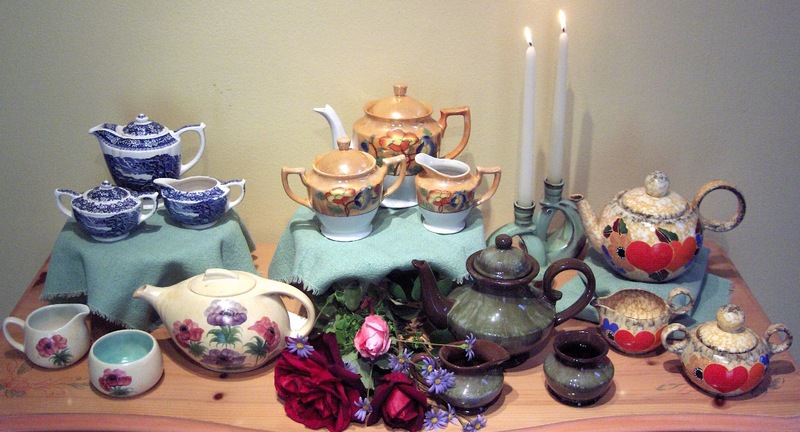 The ceremony also known as the Way of Tea embraced the principles of harmony, respect, purity and tranquility. Here in America tea drinking is a part of the culture so much so that it played a major role in the America Revolution with the Boston Tea Party. Later it was immortalized in the song “Tea for Two” from the 1925 musical “No, No Nanette” with words by Vincent Youmans and lyrics by Irving Caesar. 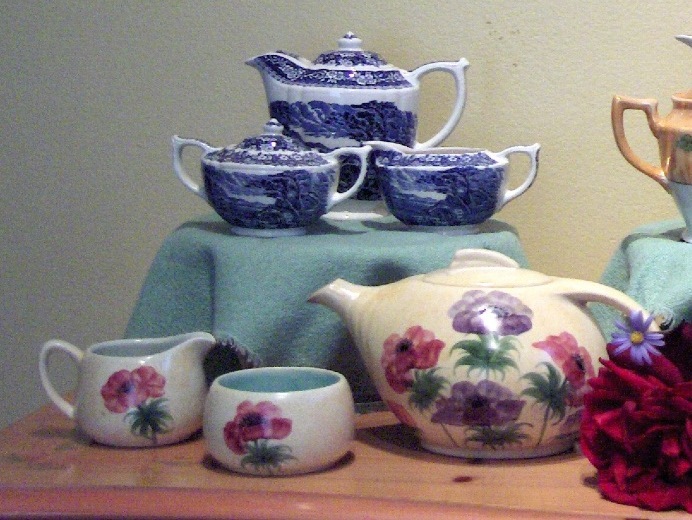 Billy Blue Eye is pleased to feature a selection of tea sets at all of our April events. Each of the sets pictured here are in excellent condition and are guaranteed to make your tea pouring ritual a special event. Sunday, April 17th Long Beach Collectible & Antique Market, located in the Veteran’s Stadium Parking Lot from 7:00 AM until 2:00 PM. We are located in space # A 853. Click here for $ .50 off Admission Discount Coupon. Saturday, April 23rd, The Whittier Uptown Antique Street Faire,Uptown Whittier on Philadelphia Street from 9:00 AM until 4:00 PM. We are located in space #36 at the intersection of Philadelphia & Friends Streets. Easter Sunday, April 24th, Jamestown Vintage Flea Market, 474 El Camino Real, Tustin from 8:00 AM until 3:00 PM. Space #45. As always look for our green & white tent. For those of you that reside outside Southern California we accept Visa, Master Card, and Pay Pal and all orders over $200.00 are shipped free. We offer a full refund if you are not completely satisfied with your order. We look forward to assisting you soon. Happy Spring, Happy Passover, Happy Easter, Happy Tea Time!